We are the region's finest t-shirt design company! Not only do we provide customized t-shirt designs for every occassion, we also provide a large assortment of promotional items for our customers including plaques and trophies that are unequalled! We provide outstanding products and we do it at a price everyone can afford. Check out our product line. If there is something you are looking for that you did not see, contact us (573) 883-2900. Our "Driver's Promotional Progam" has become a huge success for area drivers, car owners and track promoters. Ask us for complete details! Please Note: ANY of the t-shirt designs can be purchased here by simply contacting us. They can be sent to you via UPS or USPS. 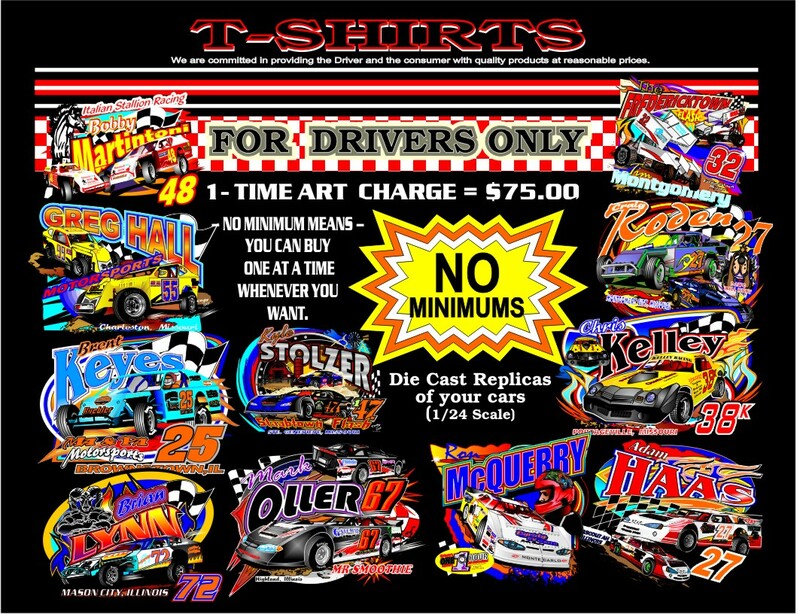 Please check back frequently because the new shirt designs will be added as soon as they become available from the various drivers.